OWENSBORO, Ky., May 6, 2011 (SEND2PRESS NEWSWIRE) — Moonlite is no secret to lovers of burgoo and barbecue mutton, so it was just another day when NBC Sports called wanting them to cook Burgoo with Chef Bobby Flay for a Kentucky Derby Special. The Bosley Family has been cooking up Kentucky’s traditional soup Burgoo at the Moonlite Bar-B-Q Inn for four generations. The burgoo recipe became a discussion between Moonlite and Bobby Flay when he wished to put Lima Beans into the soup. While Bobby Flay added it to his version, Moonlite still contends that most cooks would never put lima beans in Burgoo; as Pit Master Benny Bosley claims, “You can put whatever you want in it, I just might not call it burgoo.” The Special was filmed at Sullivan College in Louisville on May 5 and should air during the Kentucky Derby (between 4 and 5 p.m.). The center of the burgoo universe is Owensboro, Kentucky. Owensboro is located on the Ohio River, about mid-way between Cincinnati, OH and St. Louis, MO. The largest city in western Kentucky, Owensboro is known as “The Bar-B-Q Capital of the World.” This is due, in part, to the Moonlite Bar-B-Q Inn, and the world renowned International Bar-B-Q Festival held on the Riverfront the second weekend in May (May 13 and 14, 2011). Owensboro’s burgoo is a hearty soup made from mutton, chicken, and a variety of vegetables. No two cooks prepare it the same way and most keep their recipes a closely guarded secret. Burgoo is a staple at both the Moonlite and the International Bar-B-Q Festival. Moonlite also sells burgoo by mail-order on its online store http://www.moonlite.com . Moonlite Bar-B-Q Inn seats 350 people and has been voted the best barbecue in Kentucky by: AAA, Kentucky Living, and Kentucky Monthly. The restaurant prepares about 50 gallons of burgoo a day, and barbecues between 20 and 30 thousand pounds of meat per week (about half of which is Mutton). It is Mutton (sheep) which gives burgoo its distinctive flavor. Moonlite can bring Burgoo to you. They have a renowned catering department which can handle any size group and can cater anywhere in the U.S.
For more information, visit: www.moonlite.com, or check them out on Facebook at: www.facebook.com/moonlitebarbq . 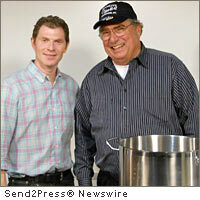 – Photo Caption: “Benny” Bosley and Bobby Flay after cooking up a Kentucky Derby Special – Burgoo. 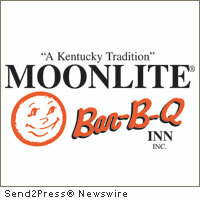 – News RSS feed for Moonlite Bar-B-Q: https://send2pressnewswire.com/author/moonlite-bar-b-q-inn/feed . Original Keywords: Pit Master Benny Bosley, Chef Bobby Flay, Burgoo soup, International Bar-B-Q Festival, mutton, best barbecue in Kentucky, NBC Sports Kentucky Derby Special, BBQ Moonlite Bar-B-Q Inn Owensboro Kentucky OWENSBORO, Ky.
REFERENCES: Entertainment News, Pit Master Benny Bosley, Chef Bobby Flay, Burgoo soup, International Bar-B-Q Festival, mutton, best barbecue in Kentucky, NBC Sports Kentucky Derby Special, BBQ Moonlite Bar-B-Q Inn Owensboro Kentucky OWENSBORO, Ky.